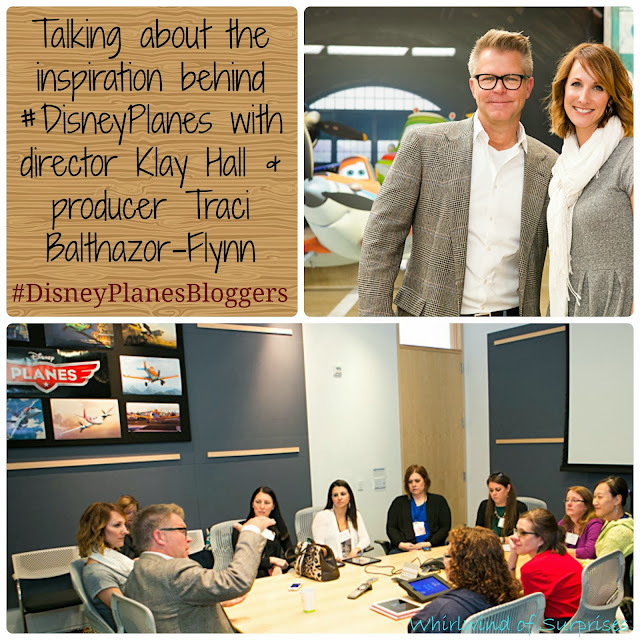 Another lovely treat during our #DisneyPlanesBloggers press day included an interview with director Klay Hall and producer Traci Balthazor-Flynn. These two are responsible for much of what transpired behind the scenes for Planes, on DVD 11/19/2013. Many of us wondered, "Why Planes?" What made them decide to do the jump from cars to planes? Originally, Klay was working with the idea of trains and the John Lasseter had a lightbulb moment one day when he was flying and figured why not Planes. Turns out Klay has had a huge history and love for planes. His grandfather was a pilot for the army and taught his dad to fly and in turn his dad taught him to fly. It was just like a dream come true for him to put together something that he love and grew up with. He's even passing on the love to his sons. Klay never realized though, how challenging it would be to make planes look real. There were a lot of challenges but having had the 10 years of experience that Cars brought, they were able to draft off their experience on how to make the characters move and act. For example, they're made of metal so can't bend and do things like that unlike rubber. Using this information though, when they looked at the airplanes, clearly, there was something different. Planes had big wings that were always in the way. It's easier to give cars faces. For example, there's a big windshield for eyes. Conversely, planes have convex glass so hard to get expressions in. The mouth is also underneath like dog or shark. Planes have tail draggers and they sit back on the rear tail so it dips down. And since they have 3-4 blade propellers, that means sometimes the eyes get blocked out. Surprisingly, there was a lot of intricacies and details that needed to be worked out before they could embrace the magic of flying with clouds and atmosphere. Klay mentioned that just to work out the flight dynamics took about 6 months because the "initial instinct of animators was speed and weight" but it just looked wrong because it "looked like plane on strings". Traci added that Disney Toon Studios pulled on Sean Bautista, a navy pilot, for his expertise. They needed to slow down the planes and consider the true weight and gas it could hold so that the planes would be realistic enough that movie goers could focus on the script. Now that I'm Minnesotan, I have some clear pride. To get inspiration for these scenes, the crew went on a road trip that included Clearlake, MN for research. They wanted to embrace a MidWest feeling: a cropduster with an agricultural background. So they landed at North Dakota then worked their way down. They found a lot of interesting places off the grid, without towers and with just a couple lights. The awesome part was that many were just out of a cornfield or hayfield. They basically got in a car and started driving like american pickers. Klay clearly oozed with enthusiasm as we talked Planes and I wasn't surprised to find out that his favorite research location was the aircraft carrier of the San Diego navy base. It was "by far the most surreal experience" for both Traci and Klay. Traci loved the multicultural aspect of the movie. Much like many of Disney Toon Studio's other movies, they would go to different countries to do research. They travelled to New York, Germany, and India. They pulled off the experiences of those who had had been to China, Japan, Mexico, and most of the other locations. The few places they didn't get to included Iceland and Himalayas. The point is though, Disney Toon Studios always tries to get the details right and embrace the difference cultures and color of the area. -Planes 2 is now in production with the expected release date of July 2014. It started on almost a parallel path as Planes. Production started 6 months after and it is all about firefighting. -Planes took 4.5 years to form concept and release so there have been separate teams working on the Planes and Planes 2. -Favorite character in the movie: For Klay, it was El Chupacabra because he's fun, got a good good heart and is a prominent racer in own world. He further enjoys the sweet story of friendship and respect. Traci is a Dottie fan because she's smart and speaks her mind yet support her friends even when she might not agree from the start.